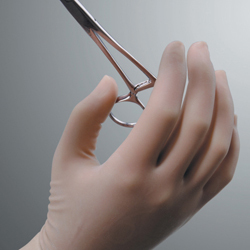 Medline's Neolon uses their proprietary neoprene formulation to provide soft, more elastic and comfortable neoprene surgical gloves. The Neolon glove has a lightly textured grip to provide more sensitivity. In addition, reinforced cuff reduces cuff tearing during donning and in use. ARC (anti-rolldown cuff) was designed to reduce cuff rolldown common with most powder-free gloves. The inner polymer coating allows easy donning both with damp and dry hands. Brown/tan color reduces the glare from the lights in the O.R.